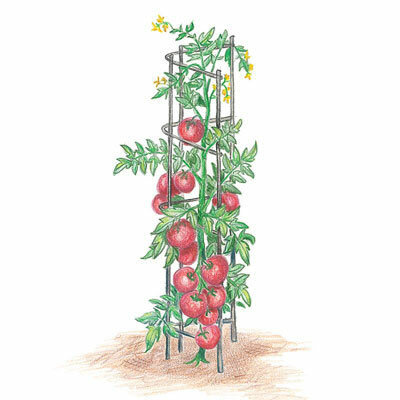 Tomato Tower | Henry Field's Seed & Nursery Co. Keeps Fruit-Heavy Plants from Breaking! These space saving supports are constructed of sturdy galvanized steel. V-shaped design will securely support each plant's main stem, simply weave stems through the grid as your plants grow, and prune excess growth. Improves air circulation and ease of harvest. Set of 3, 48-in. towers. Made in the U.S.A.
For each offer ordered, get 3 towers.